Plyometric exercises are specialized, high-intensity training techniques used to develop athletic power (strength and speed). Plyometric training involves high-intensity, explosive muscular contractions that invoke the stretch reflex (stretching the muscle before it contracts so that it contracts with greater force). The most common plyometric exercises include hops, jumps, and bounding movements. 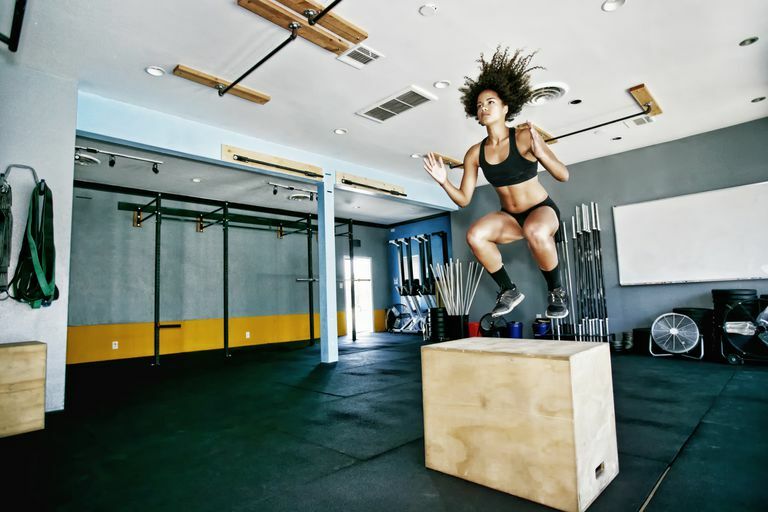 One popular plyometric exercise is jumping off a box and rebounding off the floor and onto another, higher box. These exercises typically increase speed and strength and build power. Experts in the field of exercise science have varying opinions of plyometrics. The American College of Sports Medicine states that "that plyometric training is a safe, beneficial and fun activity for children and adolescents provided that the program is properly designed and supervised." The American Council on Fitness also recommends plyometric exercise if done properly. And the National Strength and Conditioning Association offers a position stand in favor of plyometrics. Plyometrics (and any impact exercise) can increase the risk of injury if you don't follow certain safety precautions. The tremendous force generated during these moves requires that athletes use them sparingly and with proper training. The most important aspect of a safe and effective plyometric program is developing a safe landing technique. This means the athlete lands softly on the toes and rolls to the heels. By using the whole foot (and a larger surface area) for landing, it helps dissipate the impact forces on the joints. The other key to proper landing is to avoid any twisting or sideways motion at the knee. Pay attention to injury warning signs. This plyometric training program has been used to prevent ACL injuries in women soccer players. The ACL injury prevention program has been found to reduce the number of ACL injuries significantly. It is a training regimen that teaches avoiding vulnerable positions, increases flexibility and strength and uses plyometric exercises. Keep in mind that you can develop a great deal of strength and power without resorting to plyometrics, but if you participate in sports that require jumping and landing, plyometric training may be beneficial to improve skill and performance. Plyometric Training for Children and Adolescents, December 2001. American Council on Exercise, Plyometrics: Controlled Impact/Maximum Power, Fit Facts, 2001, M01-076 PLY - 52.